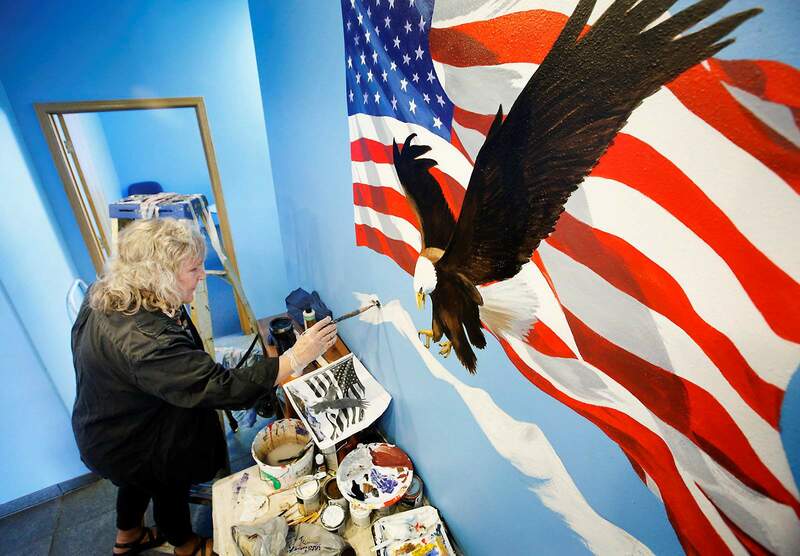 Artist Victoria Fae Roberts paints a mural Thursday inside the Veterans Outreach Center of La Plata County in Bodo Industrial Park. The center will hold a grand opening celebration Friday. Bob Collette, from left, with the local chapter of the Disabled American Veterans; Michelle Johnson; Candyce Tart, a clinical physiologist; and Robert Lewis, Farmington Vet Center Outreach specialist; talk about the opening of the Veterans Outreach Center of La Plata County in Bodo Industrial Park. The nonprofit center offers free counseling, emergency financial aid and other free services for veterans. A new veterans’ center quietly opened last month in Bodo Industrial Park south of downtown Durango to provide emergency aid, free counseling and a variety of other services to those in need. The nonprofit, Veterans Outreach Center of La Plata County, is run by veterans and aims to provide a welcoming environment that ensures more veterans receive services if they are homeless, jobless or otherwise in need, said Candyce Tart, a staff psychologist for the Department of Veterans Affairs. “It’s a place for community and recovery,” she said. Many veterans have already visited the center in its first month, including some experiencing thoughts of suicide, said Jesse Sheets, a U.S. Marine Corps veteran, who volunteers at the front desk. He has already seen the center make a difference for those in crisis and experiencing post-traumatic stress disorder. “Slowly, you can start seeing the change in them,” he said. Sheets was homeless and unemployed before coming to the center in August. The volunteer staff immediately housed him and got him an appointment with a counselor. “If I have a bad day, they understand exactly what I’m going through,” said Sheets, who served in Afghanistan. The center expects to employ Sheets through a work-study program while he works on his psychology degree, Tart said. About two-third of veterans visiting the center are from the Vietnam era, and the rest are in their late 20s and early 30s and served in Iraq or Afghanistan, she said. The idea for the center germinated at a community-wide suicide prevention summit held in May 2017, Tart said. Veterans were a topic at the summit because they are at a higher risk for suicide. An average of 20 veterans die each day by suicide, and most have not accessed health care through the Veterans Health Administration, according to a 2016 VA report on suicide. At the summit, concerned residents identified the need for a drop-in center where veterans can walk in to see a mental-health provider that same day without having to wait for an appointment, she said. Other communities across the country, including Cortez and Glenwood Springs, have similar drop-in centers for veterans. The success of those centers encouraged local groups to open a center in Durango, she said. The La Plata County chapter of the Disabled American Veterans bought the building in Bodo Industrial Park in July to house the center. An anonymous donor also provided the center with operating funds for eight months, Tart said. 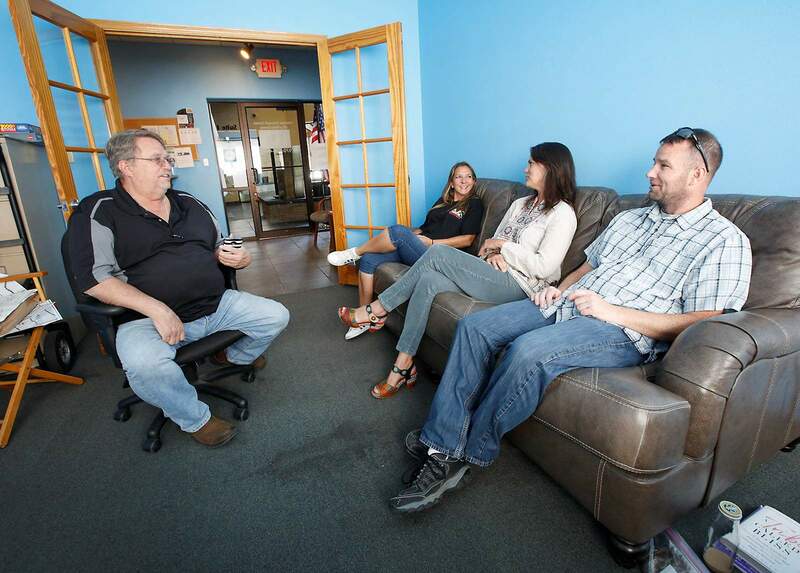 The Veterans Outreach Center of La Plata County is located at 72 Suttle St., Suite I, in Bodo Industrial Park. The La Plata County chapter of the Disabled American Veterans bought the space for the new nonprofit center. An independent nonprofit will form to run the center and manage grants and fundraising for the center in the long term, she said. 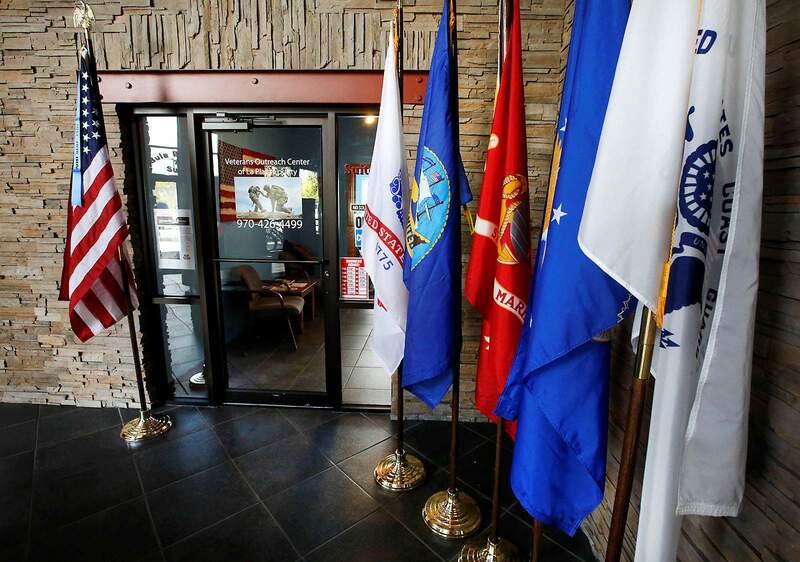 Veterans who visit the center are greeted at the front desk by a veteran who has been trained in some soft counseling skills and personally makes sure veterans are connected to the proper services, she said. The DAV funds a counselor, Stephen Brown, who can see patients right away and help Tart with her caseload. Some veterans may stay with Brown and others may go on to see Tart, who specializes in serving veterans with PTSD and military sexual trauma. Tart has a three-month wait list for regular treatment, in part, because she is one of two VA psychologists for the region and must split her time between Durango and Farmington. “We’re understaffed, but that is a national problem,” she said. She expects the center’s social aspects, such as barbecues and classes, will promote mental health wellness among combat veterans, who have a tendency to isolate themselves. “For a veteran to reconnect with another veteran can be incredibly healing,” she said. For veterans facing financial problems, the DAV will provide emergency aid to house veterans on a short-term basis or help with other expenses such as utilities or car repairs. The DAV has received federal grants for several years to provide services. The group has provided aid to about 1,500 veterans in the last year and expects to serve many more through the center, said Bob Collette, the DAV’s counsel pro tem liaison for veteran’s affairs. The center cannot provide housing, but the staff will help veterans connect with representatives from Volunteers of America and the VA who can help with housing. Volunteers at the center also provide acupuncture, yoga classes and energy healing therapy to help with anxiety, among other services. Tart said she hopes the center continues to expand its services. “We’re hoping that we grow out of this building,” Tart said. The grand opening of the Veterans Outreach Center of La Plata County will be held from noon to 3 p.m. Friday at 72 Suttle St., Suite I.